William Sewell at Massachusetts Eye and Ear Infirmary and Harvard Medical School and Jeffrey Borenstein at the Charles Stark Draper Laboratory in Massachusetts have developed an automated micropump device for direct delivery of drugs into the perilymph fluid within the cochlea. This has potential for use in the treatment of sensorineural hearing loss and would remove the toxicity issues that are common when drugs are administered systemically. This is one of the most common forms of hearing loss and is caused by damage to the sensory hair cells or to the auditory nerve. Due to the small volumes of perilymph fluid within the cochlea (~ 0.2 mL) and the sensitivity of the ear, the authors have developed a reciprocating delivery system, where an accurate volume of the concentrated drug can be infused and, once given time to distribute, the same volume of fluid can be withdrawn, resulting in zero overall net increase in cochlear fluid. The specific design also minimised the dead volume present in the device in order to reduce the amount of pumping needed, and by incorporating capacitors, prevented high flow rates during pumping, which can lead to cochlear damage. The authors emphasise the need for a device that is small and lightweight enough to be implanted near to the cochlea and that is also able to administer precise sub-microliter volumes of fluid over several days or months. The microfluidic device presented in Lab on a Chip has been fabricated onto a ~4 x 3 cm chip and is capable of delivering accurate and repeatable volumes of fluid over more than 1000 pump strokes. The authors highlight that by incorporating the device onto a head mount, this particular design could be used in animal models for preclinical drug characterisation, where extensive studies are required. All the fluidic components of this system have been incorporated into the chip, so that, if battery operated, it could be used as a stand-alone device. In this design, a separate controller was used; however, it is stated that the control circuitry could also be miniaturised and incorporated into the chip, for use with a battery. Efforts were also made to minimise the power consumption of the pump for this purpose. 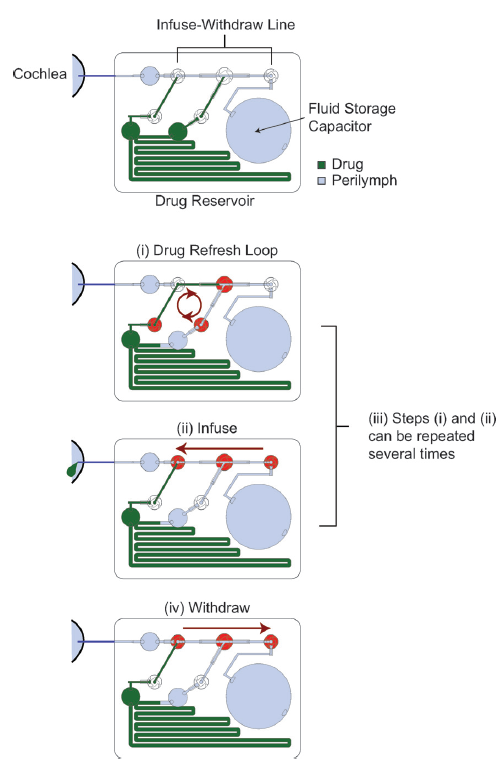 The main components of the device are a drug reservoir, a fluid storage capacitor which contains artificial perilymph for flushing the system, an infuse-withdraw line, and multiple valves to control the different steps of the drug delivery process, as shown in the diagram. Dose control was successfully demonstrated by loading the pump with fluorescein as the test drug and monitoring the fluorescence of the aliquots collected following different dosage schemes. Several studies were also carried out on guinea pigs using a glutamate receptor antagonist as the test drug. This compound reversibly suppresses compound action potentials (CAPs) in the cochlea – monitoring changes in CAP amplitude and threshold can be used to test for hearing loss. The results showed that fully reversible hearing loss was induced and this was used to estimate the optimum wait time between infusion and withdrawal for the reciprocating delivery. The distribution of the drug in the ear was also monitored by measuring changes to CAPs at different frequencies and comparing these to the known tonotopic organisation of the cochlea. To test for cochlear damage, the authors monitored another hearing response (distortion product otoacoustic emission) that was not expected to change, and determined that there was no acute mechanical damage. This drug delivery system has excellent potential for use in clinical and preclinical trials and also for long term treatment of hearing loss using existing drugs. The potential for battery operation is particularly important, and is an aspect that the authors are now focusing on for future work. 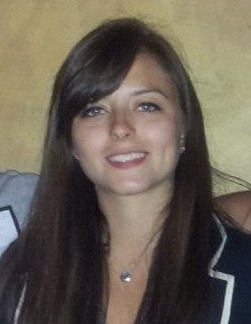 Claire Weston is a PhD student in the Fuchter Group, at Imperial College London. Her work is focused on developing novel photoswitches and photoswitchable inhibitors. *Access is free until 05/04/2016 through a registered RSC account.